HOUSTON – ConocoPhillips (NYSE: COP) today reported fourth-quarter 2017 earnings of $1.6 billion, or $1.32 per share, compared with a fourth-quarter 2016 net loss of $35 million, or ($0.03) per share. 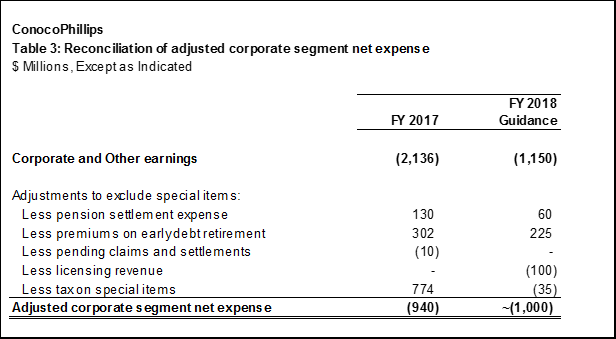 Excluding special items, fourth-quarter 2017 adjusted earnings were $0.5 billion, or $0.45 per share, compared with a fourth-quarter 2016 adjusted net loss of $0.3 billion, or ($0.26) per share. Special items for the current quarter were primarily driven by benefits from U.S. tax reform and the settlement of Ecuador arbitration. Use of Non-GAAP Financial Information–To supplement the presentation of the Company’s financial results prepared in accordance with U.S. generally accepted accounting principles (GAAP), this news release and the accompanying supplemental financial information contain certain financial measures that are not prepared in accordance with GAAP, including adjusted earnings (calculated on a consolidated and on a segment-level basis), adjusted earnings per share, operating costs, adjusted operating costs, replacement from net additions and organic reserve replacement. 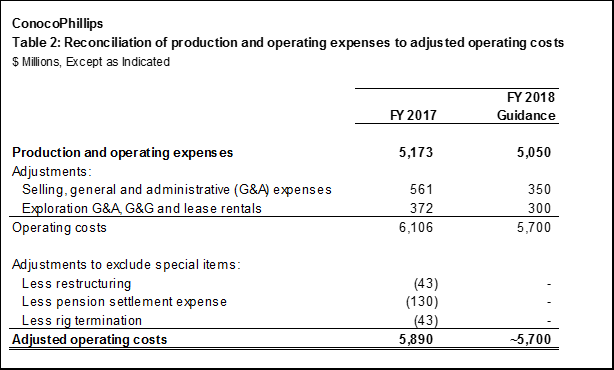 Operating costs is defined by the Company as the sum of production and operating expenses, selling, general and administrative expenses, and exploration general and administrative expenses, geological and geophysical and lease rental and other expenses. Adjusted operating costs is defined as the Company’s operating costs further adjusted to exclude expenses that are included as adjustments to arrive at adjusted earnings to the extent those adjustments impact production and operating expenses, selling, general and administrative expenses, and exploration general and administrative expenses, geological and geophysical and lease rental and other expenses. 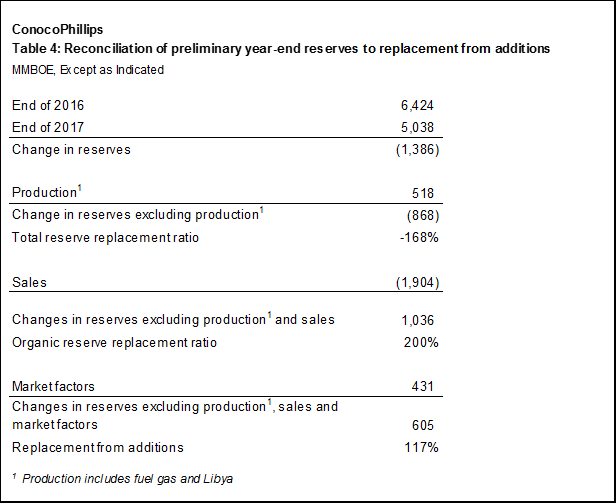 Replacement from net additions is defined by the Company as a ratio representing the net change in proved reserves excluding production, sales and market factors divided by production. Organic reserve replacement is defined by the Company as a ratio representing the net change in proved reserves excluding dispositions and divided by production. The Company believes that the non-GAAP measures adjusted earnings (both on an aggregate and a per share basis), operating costs, and adjusted operating costs are useful to investors to help facilitate comparisons of the Company’s operating performance and controllable costs associated with the Company’s core business operations across periods on a consistent basis and with the performance and cost structures of peer companies in a manner that, when viewed in combination with the Company’s results prepared in accordance with GAAP, provide a more complete understanding of the factors and trends affecting the Company’s business and performance. The Company further believes that the non-GAAP measure adjusted operating costs provides a more indicative measure of the Company’s underlying, controllable costs of operations by excluding other items that do not directly relate to the Company’s core business operations. The Company believes that the non-GAAP measure replacement from net additions is useful to investors to help understand how net additions to the Company’s reserves from all sources other than changes in market factors, such as price, and dispositions compare with the Company’s production. The Company believes replacement from net additions, when viewed in combination with the Company’s results prepared in accordance with GAAP, provides a more complete understanding of the factors and trends affecting the Company’s business and performance. The Company believes that the non-GAAP measure organic reserve replacement is useful to investors to help understand how net additions to the Company’s reserves from all sources other than changes in dispositions compare with the Company’s production. The Company believes organic reserve replacement, when viewed in combination with the Company’s results prepared in accordance with GAAP, provides a more complete understanding of the factors and trends affecting the Company’s business and performance. The Company’s Board of Directors and management also use these non-GAAP measures to analyze the Company’s operating performance across periods when overseeing and managing the Company’s business.